Having upgraded my primary production machine to Windows 7 over the weekend (see my recent ViztaView blog for those details) I’m now really settling in with the new OS and learning to live with it on a daily basis. Though I do have 6 months of uniformly positive experience with various Windows 7 beta releases from Build 7000 to 7100 (the release candidate, or RC), only now am I truly living and breathing this OS on the machines that matter most to my day-to-day working success: my primary desktop and notebook machines (one for work in the office, the other for work on the road) and my Big Kahuna test machine (where I now use VMs to play host to any and all of the myriads of software that I regularly investigate, test, and review). 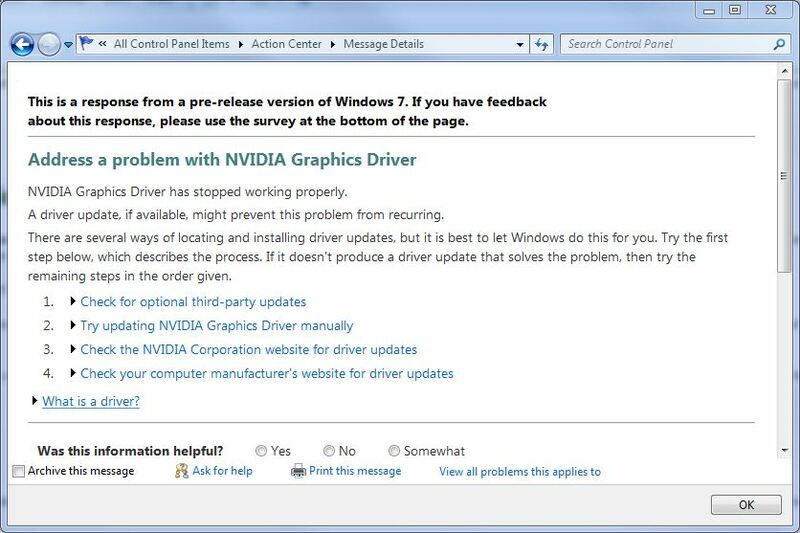 At some point, my brief graphics outages triggered a Windows 7 error message. Also on my hit parade: Outlook goes south, and a .sys file has ACL issues. Now, the real sleuthing work begins and I really start to get to know Windows 7. Most of my learning is problem driven at first, and it looks like I will have plenty of food for learning and thought as I begin to dig into the day-to-day rhythm of working with this new OS. A blog for IT professionals who work with Windows on large networks.